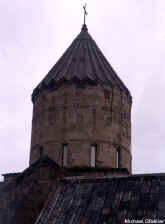 The village of Halidzor was donated to Tatev monastery in the 10th c. It has an early 17th c. church and, 1 km E, Vanasar, a site with khachkars, which Prince Tarsayich Orbelian gave to the architect Siranes as payment for building Amaghu Noravank. of Tatev and the nearby fortified Tatev monastery. In the S part of the village is Tatev hermitage (Tatev Anapat) of the 17th c. There is also a site near Tatev, village called Tsuravank, a monastery of the 10-17th c. A difficult dirt road, requiring good ground clearance, continues S from Tatev through beautiful wooded country.